Take Route 3 South into Massachusetts, take exit 32 on to Drum Hill Rotary, Exit rotary at Route 4 North, Follow Route 4 for about 2 miles, Chelmsford Holding Mill is on the right, across from the European Restaurant. Take Route 3 North (right by Burlington Mall) Continue on Route 3 North until you reach exit 32 (Drum Hill), Exit the rotary at Route 4 North, Chelmsford Holding Mill is on the right, across from European Restaurant. 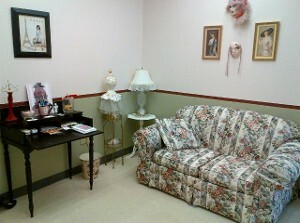 The Lavara Couture Studio has 2 rooms, front room (pictured below left) is the reception and fitting room. 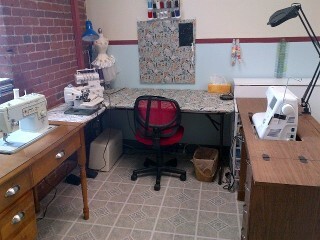 The second room (pictured below right) is the sewing room.